Assassin’s Creed is a series that has eluded me. Owning only Nintendo consoles, I’ve never had much of a chance to play any of the previous installments. Now, with Assassin’s Creed III finding a home on the Wii U, I’m able to see what all the fuss is about. 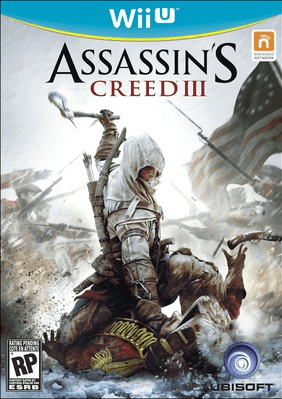 Assassin’s Creed III has come to the Wii U! If this is your first Assassin’s Creed experience, as it was mine, you might want to get up to speed with the series via a short synopsis. The overarching plot of the series is incredibly convoluted. It follows the exploits of a young man named Desmond, who must live the lives of his ancestors through a device known as the Animus in order to find clues as to the whereabouts of artifacts left behind by an ancient civilization to prevent the destruction of the world, all the while avoiding the Templar-operated company of Abstergo. But that’s only one part of Assassin’s Creed III‘s plot. There’s another part in which Desmond relives the experiences of his ancestor, Connor, a half-British, half-Native American assassin who lived inAmerica during the Revolutionary Period. This part of the plot requires no previous knowledge of the series. Thus, if you have no interest in Desmond’s plights and the American Revolution parts are all that interest you, you’ll feel right at home. Overly complicated story arcs aside, the game still has a well-written plot with interesting, rounded characters. It takes its sweet time to get to the heart of the matter, though. 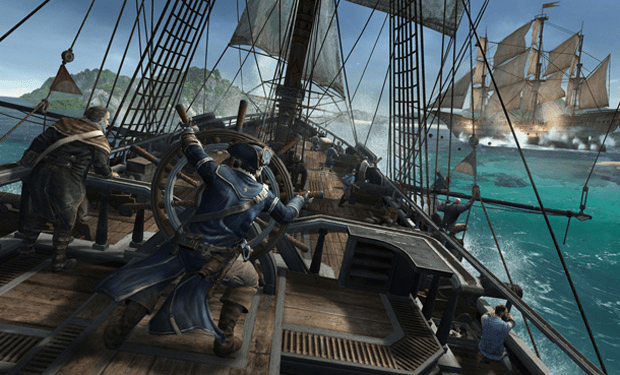 In fact, the first four hours of the game are spent playing as Connor’s father, Haytham, in the days before Connor was even born. Unfortunately, the game’s ending is the very definition of anticlimax and, to make matters worse, it ends on a cliffhanger. And that’s why he’s called cliffhanger! 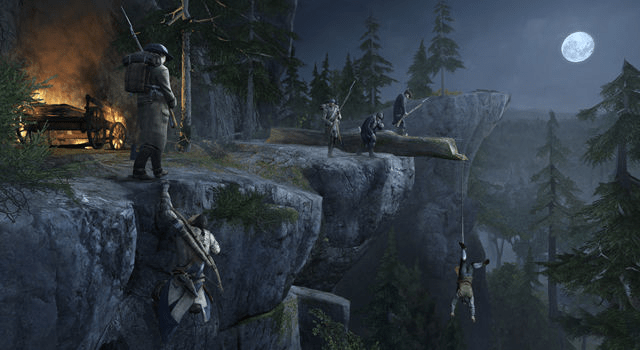 Assassin’s Creed III is visually stunning. Everything is crisp and clean. The environments are beautiful as well. Textures do have a tendency to blur, especially during cutscenes. This might have been remedied if said cutscenes weren’t rendered on the Game Pad at all times, even when the game hasn’t been directed to it. There are also numerous other glitches as well. Characters clip in and out of other objects and the physics can get a little wonky at times. It’s nothing game breaking. In fact, if you’re like me, you might find it amusing. However, it does show a certain lack of polish. 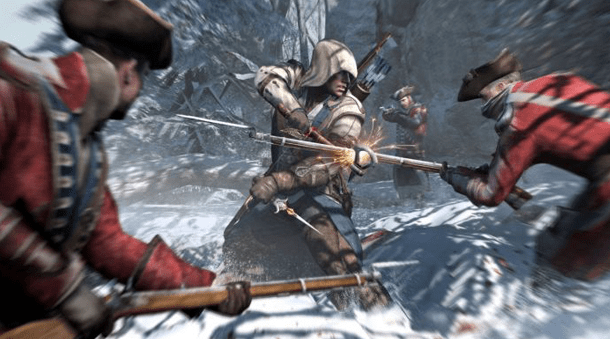 Your basic objective in Assassin’s Creed III is to kill things, whether it be man or beast, high-profile target or common grunt. For a game about assassins, a type of fighter better known for striking from shadows than out in the open, there’s a surprising focus on hand-to-hand combat as opposed to stealth killing. Stealth is practically discouraged. Enemies tend to gather in groups and out in the open, away from convenient cover. When stealth is made possible, it is generally the type of stealth mission that slaps you with a “Game Over” whenever an enemy spots you, as opposed to giving you a chance to fight or flee to get out of the sticky situation. The focus on hand-to-hand combat is disappointing as the hand-to-hand combat in Assassin’s Creed III isn’t very engaging. It’s satisfying, to be sure. Connor’s fighting style is equal parts graceful and brutal. That said, the combat is a bit too easy. That’s not to say that you won’t die at all, as you probably will. What I mean is that the combat is too obvious. Let me explain. When in hand-to-hand combat, a bright, red triangle will appear over an enemy’s head, right before they attack Connor, alerting the player and giving them the chance to counter. The problem with this is that enemies already telegraph their attacks as it is. Having a triangle appear over their head seems a bit over the top. It also makes the combat a little repetitive. Once Connor has countered an enemy’s attack, all the player has to do is press a button, and Connor will insta-kill the enemy. This means that your best option is to remain stationary and wait for some unlucky goon to take a whack at Connor with a red triangle above his head signalling his intention. The problem could have easily been remedied, as shown by the Desmond sections of the game. When playing as Desmond, the game foregoes giving the player blatantly obvious attack cues. This makes combat more interesting by forcing the player to actually pay attention to enemy movements instead of waiting for a triangle to appear over their head. The Average Redcoat doesn’t even stand a chance. Making matters worse is the game’s insistence on forcing frustrating objectives on you. Most of these objectives are optional, but a few of them are mandatory, resulting in a “Game Over” should you fail to fulfill them. These aggravating objectives range from avoiding detection, lock-picking, eavesdropping on a conversation, and pursuing a fleeing target. The last of these is especially annoying as the run and climb actions are mapped to the same button, resulting in many a frustrating instance when you veer too close to a wall in your pursuit and lose precious distance, having to watch Connor slowly clamber up a wall. All these faults would have been lessened if the game were more interesting. As it is, Assassin’s Creed III is heavily padded, to the point that half game seems bogged down in tutorials. There is an almost suffocating amount of content. Usually, more content is a boon for a game, but in this instance, it just serves as yet more padding. There are sidequests, collectibles, and resources to gather. The problem is that so little of the extra content is pertinent to the actual game. Generally, completing sidequests and gathering resources nets the player more spending money. But there’s nothing worthwhile to spend your money on; no health, weapons, or armor upgrades. You can still buy weapons and outfits, but they’re only available for aesthetic purposes. There are also naval missions, but these don’t serve much purpose either. In the end, this padding is Assassin’s Creed III‘s chief problem. There’s so much content standing between the core game. Some might try to counter-argue that this content is optional and, “if you don’t like it, don’t play those parts”. But the time spent in making this content could have been better put to developing the core elements: the story, the environments, the enemies, the stealth, and so on. The game also has an online multiplayer mode. In essence, this mode is a glorified game of cat-and-mouse. 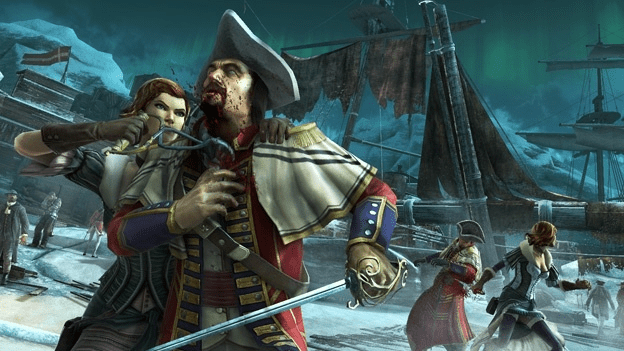 The goal is to assassinate other players, which may sound simple enough, but is much harder in practice. The maps are littered with lookalike characters. It’s the players job to distinguish from a clone and an actual player, keeping an eye open for unusual activity, all the while keeping their own identity as a player secret. It’s an engaging system that keeps players on their toes, balancing risk and reward. Just another day in Assassin’s Creed multiplayer, I guess. It should be evident by now that my opinion is based on the Wii U version of the game. That said, it’d be fitting if I discussed a few of the key features offered on Nintendo’s new console. 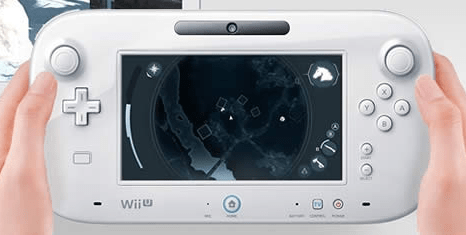 Mostly, the second screen on the Game Pad shows your map, complete with icons marking objectives and collectibles. It’s a nice addition, and will certainly aid in exploration. The Game Pad can also be used to select equipped weapons, but it’s a missed opportunity. Instead of being able to select your weapons on the fly, you still have to pause the game to access the Weapon Wheel. Having a map on the second screen is pretty useful. Perhaps the most interesting feature is the ability to play the game on the Game Pad’s second screen. At any time, except during cutscenes, you can bring the game down to screen and play it on that. The game looks pretty good on the second screen. There’s not much lost in the transition. After all my complaining, I have to admit that Assassin’s Creed III is still an enjoyable game. It has its moments and its high points. However, the game tries to do so much that it buries its good aspects, leaving players to dig through a mountain of needless, uninspired dross. 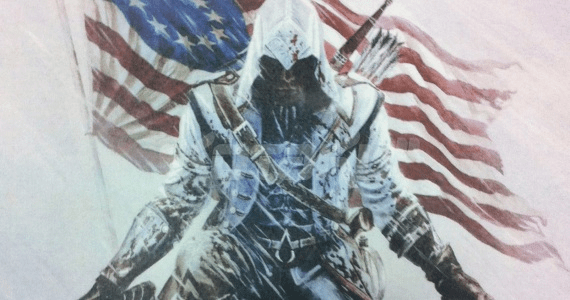 So, if you don’t mind doing a lot of excavation or if you were a fan of the series to begin with, Assassin’s Creed III might just be worth a buy. 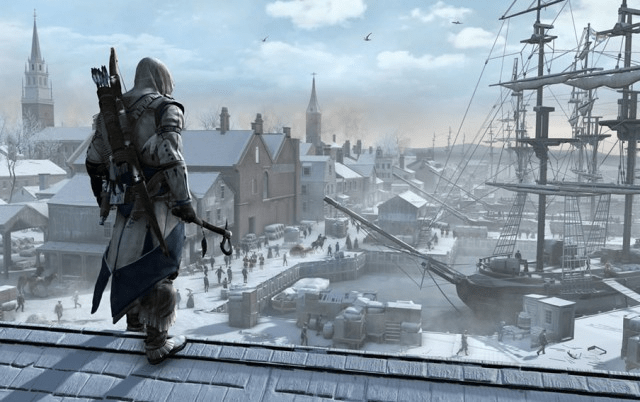 Assassin’s Creed III has it’s moments, but it’s far from a masterpiece. Previous Post:RUMOUR: Xbox 720 Set for Holiday Season 2013?